Most people know three things about this mountain: it’s name, it’s the third tallest mountain in the world, and it’s in North America. If your lucky you may find someone who knows that it’s in Alaska; even luckier and you may find someone who knows it’s proper Native Alaskan name, Denali. I grew up in the shadow of this mountain, The great one as it is named by the natives in their own language. For most of my life it has loomed in the distance, a towering reminder of just how small we all are and how little man has accomplished in the face of nature. This mountain has shaped my life in a number of interesting ways. It brings tourists from across the world which would crowd my small hometown of Talkeetna, Alaska every summer swelling the population to five times it’s winter size. This gave me contact with diverse cultures by simply giving me the opportunity to talk to people from all over the world. I have met people from all seven continents on the quarter mile stretch of road that composes downtown Talkeetna. Were it not for Denali I’d never have met many people outside the town's small year round population. When I came of age The Great One ensured that I could always find a summer job. The tourism industry booms in the summer sun as people come from all over to see the sun rise and set over the powerful peak. These people have to eat and their dishes must be cleaned so I found my first job as a dishwasher in a local eatery. This could not have happened without the help of The Great One. Denali ensured that I was exposed to many creative ideals from a young age. The picturesque valley and rivers that lay at the feet of it’s southern roots draw artists and others from distant places to come and live and capture the beauty of this largely wild land. My teachers from 3rd grade through high school were some of the greatest artists and intellectuals I have ever known encouraging all of their students the think and create in interesting and powerful ways. Were it not for the mountain and the land it fathered I doubt that many would have stayed long. The Great One even shaped the very weather as it formed a formidable obstacle to any advancing system and unleashed it’s own snow and rain upon the lands all around. As I learned all of this through my years and as I sit and write it now I can begin to understand why the ancient peoples may have worshipped this mountain. The rivers fed by it’s glaciers gave me water. Weather created by it’s sheer size brought rains that fed the forests that sheltered my home. People drawn by it’s beauty gave me education and companionship. 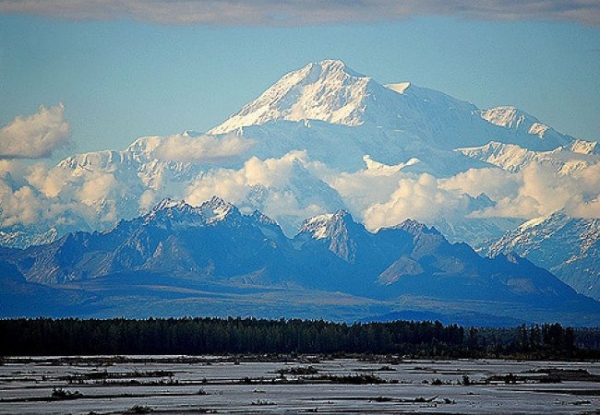 The ancients respected the power of this mountain naming it Denali, The Great One. I too have come to respect it. I thank it for my life as it would not be the same without it.